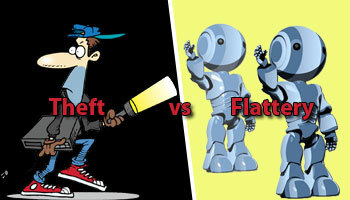 Sharon Drew Morgen » What is theft and what is flattery? What is theft and what is flattery? Thank goodness for Google Alerts. I was alerted today to a man promoting his ‘new sales model’ that uses some of my terms (terms that took me decades to come up with), some of my phrases (word for word from articles I’ve written), some of my ideas, and one of my Facilitative Questions (a type of question that takes great skill and training to formulate, as it uses a specific technique including brain function, memory storage and unconscious criteria). To add insult to injury, he’s taken the ideas and put them into a form of sales based on ‘helping buyers decide’ but all from the sales angle – so not at all based on what my terms were coined to mean. What if folks are not familiar with my material, read his, and find mine later? Do I appear to be plagarizing? Are my ideas then the ‘wrong’ ones? Do I have legal recourse? Well, except for the Facilitative Question which was lifted directly from one of my books with just 2 small changes, he could make a claim that I have no legal right to the material since he added his own words around mine. Except for my registered, copyrighted term Buying Facilitation™, I do not. But a bit of attribution might be in order. I don’t want to make a big deal out of it, as everyone has a right to make a living. But hey, folks, let’s stay in integrity here. Of course, after decades of developing Buying Facilitation™ and calling it a decision facilitation model, I’ve put the term into the world and it no longer ‘belongs’ to me (as if it ever did). But to be honest there is some flattery here. I’m excited to know that my ideas are no longer ‘in the closet’ and now being gobbled up by mainstream. I’m flattered that the thinking is finally acceptable, albeit in a form that I was working so hard to avoid, and I’m no longer an eccentric crazy person. But where is the line? Where can I expect attribution? We all still know that Neil Rackham invented SPIN and that Linda Richardson invented Consultative Selling, and that David Sandler invented Sandler Sales. I hope it’s recognized far into the future that I invented Buying Facilitation™ and coined the terms decision facilitation and Facilitative Questions. I don’t know where the truth is here. I can objectively see it from both angles. At the end of the day, it seems as if my ‘baby’ is now walking. And for that I’m proud. Now I just hope that the folks that ‘borrow’ the material will have the integrity to at least get it correct (on an earlier email this guy made a nasty comment about my ‘the sales model is br0ken’ ad for my new book – so he’s borrowing my thinking on one hand, and putting it down on the other!) and recognize that the sales model is indeed flawed, and only manages the solution placement end of the buying decision (this guy’s material uses my terms to help the seller place solution). At the end of the day, let’s hope that all folks become Buying Facilitators and Decision Facilitators using the phrases and definitions that I coined many years ago. If so, we’ll all be servant-leaders and ensure that our friends, colleagues, family, and prospects make good decisions with no bias. And the world will be a better place. But I wouldn’t mind just a tad of attribution occassionally. NOTE: Joe has since taken down his post, with an apology to me. Thanks, Joe. I just finished your book (Dirty Little Secrets) and have recommended it to others, including a short post on my blog – with attribution of course :-). I have to say that I recognized the level of time and work you have put into developing the model and would agree that you should at the very least receive proper credit for that work. Unfortunately the less ethical, and creatively challenged, among us don't seem to care much about that. Although it is admirable that in this case the offender took it down – but why do that in the first place? I have also done a fair amount of counseling and find that there are many parallels to Buying Facilitation in terms of helping people discover answers for themselves. I have incorporated my training in counseling with my own sales efforts over the years, but your work is the first I have seen that applies it so well to the sales process. My business focus right now is in helping smaller companies weather the current economic cycle. I believe I saw you mention something in a previous post about developing a Buying Facilitation program geared to that market. I'd be interested in knowing more if that is something you have in the works.